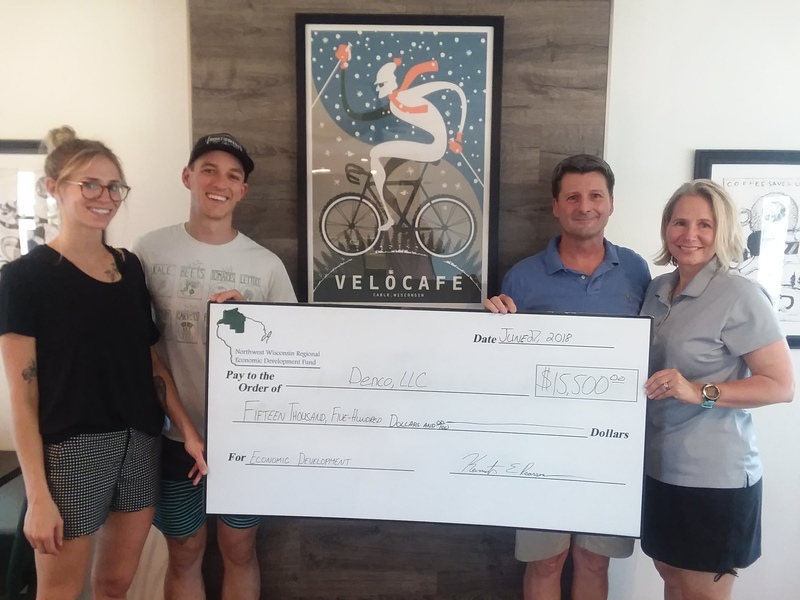 The Northwest Wisconsin Regional Business Fund Inc (NWRED) and the Northwest Regional Planning Commission (NWRPC) SBA Micro Loan program awarded loan funding for Denco LLC (d/b/a Velo Café and The Exercise Lab) for façade improvements and startup capital. Deneen and Rick Carpenter have purchased a centralized lot in the designated historic business district of the Town of Cable. Their hopes of turning the former bakery/coffee shop and adjacent garage into a centralized anchor business for Cable events and activities is their main goal. Denco, LLC is the parent company for The Velo Café, LLC, a coffee shop and limited-service restaurant that provides coffee, greens and protein, and The Exercise Lab, LLC, a fitness facility. The Velo Café footprint consists of a commercial coffee shop that had been converted from a residential home. This healthy alternative location is a great option for the outdoor enthusiasts, foodies, and locals who are seeking a different dining option in comparison to the traditional Northwood’s fare that is present in the Cable and Namekagon area. The Velo Café will boast of providing smoothies, espresso drinks, and portable foods that will be healthy and sustainably sourced. The Velo Café hopes to become the centralized host for events, residents and visitors of Cable’s various activities and reunions. The Exercise Lab, LLC, which was formerly a garage, is now an open concept fitness facility. Currently, individuals who are seeking yoga, weightlifting or cardio exercise machines in a corporate setting need to drive to Hayward or Ashland. A fitness facility located next to a coffee shop that offers a healthy alternative for locals and visitors alike will become a destination venue. The presence of the coffee shop focusing on whole and nutritious foods also ties into the wellness aspect of having the fitness center present. The effort is also focused on becoming a family affair, as Deneen’s daughter and son-in-law will be the primary managers and employees during the launch. They have relocated from Minneapolis/St. Paul to find a lifestyle that is attractive to their outdoor passions, to raise their young family, and to be dedicated employees for The Velo Café. To see if your business would qualify for a startup, transition or expansion loan product at NWRPC, contact loan fund manager Ken Pearson at (715) 635-2197. ⇐Previous NWRED and NWRPC Awards Transition Funding for Bant Law Office, LLCNext⇒Funding Available to Plant Trees!